In recent years the role of automation in software development has expanded dramatically. 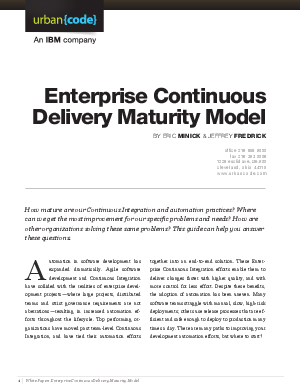 Continuous Delivery has increased automation efforts throughout the software development lifecycle. This is especially true in enterprise development projects where distributed teams and strict governance requirements are the norm. Presents a model for grading your Build, Deploy, Test & Reporting maturity. Examines which cutting edge processes are appropriate for different companies. Provides aggregate case studies showing how different groups would choose to mature differently.